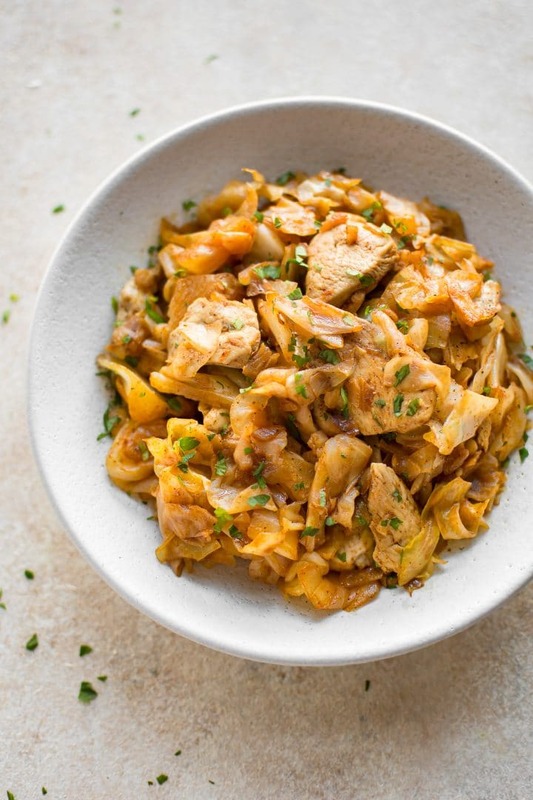 This chicken and cabbage stir fry recipe is fast and easy. The chicken is soft and tender, and the onions and cabbage melt in your mouth. Ready in just over half an hour! I based this chicken and cabbage recipe on my popular sautéed cabbage and kielbasa recipe. It’s cooked in a similar fashion, and it’s just as delicious. Since I grew up with plenty of Czech and central European food, it’s no wonder that I love cabbage so much. Somehow, I don’t manage to eat it that often, though. I’m always so surprised at just how flavorful fried cabbage is. It’s just so good. You really don’t need much in the way of seasoning to make this recipe taste delicious. I used your standard mild paprika, some fresh garlic, and an onion, along with the usual salt & pepper. I don’t feel like this recipe needs anything else, but you could always swap the mild paprika for hot paprika or smoked paprika if you wish. 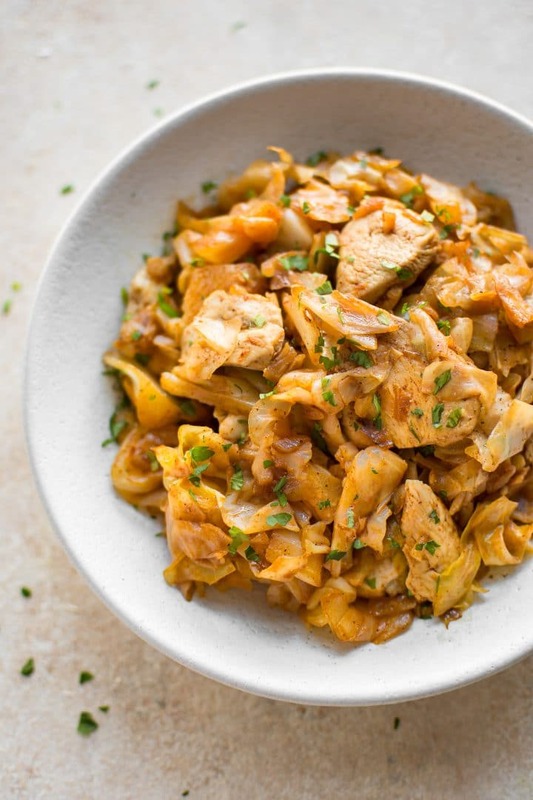 This low-carb chicken and cabbage recipe is actually pretty healthy. Add the cabbage and cook (tossing/stirring frequently) for about 10-15 minutes or until it starts to get nice and tender. Finish the dish by adding the chicken back it into the pan and heating it through. Making chicken sautéed with cabbage is easy. You can always use chicken thighs if you prefer, but I find chicken breast is fine since we don’t overcook it. It remains juicy and tender. I actually quite enjoyed the leftovers too. The chicken was still tender, even after being microwaved the next day. Pro tip: You don’t have to be super precise with measurements here. 2-3 chicken breasts… whatever you buy or feel like putting in. I say a medium cabbage, but I bought half of a MASSIVE cabbage that I cut into half again, and that totaled about what you’d expect from a medium cabbage, so don’t worry about precisely measuring. If you want to add more paprika or garlic or whatever, go ahead. I suggest tasting and adjusting until it’s perfect. Keep in mind there’s a lot of cabbage in here, so add enough salt to give it flavor. Optional: Serve with some sour cream. 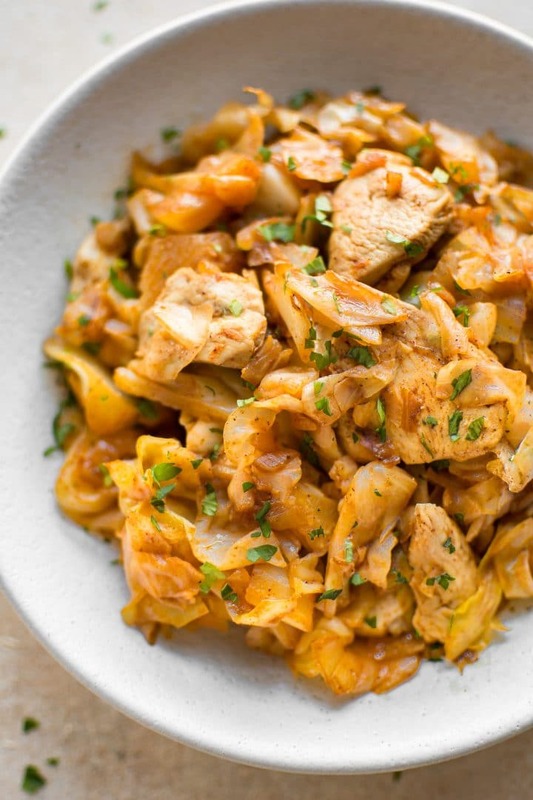 Will you make this cabbage sautéed with chicken? I think you should give it a go! Love cabbage? Give my Crockpot cabbage soup a try. Add the olive oil and chicken to a skillet. Sprinkle with salt & pepper. Turn the burner to medium-high heat and sauté for about 7 minutes (stirring fairly often), or until the chicken is just cooked through. Add the butter and onion to the pan and sauté for 3 minutes. Add the cabbage to the pan and cook for about 10-15 minutes uncovered, stirring fairly often, until the cabbage is nice and soft (or cooked to desired tenderness). The cabbage at the bottom of the pan will start to wilt after a few minutes and it will become easier to stir. The onions will also start to lightly brown and become more flavorful. Stir in the garlic and paprika. Add the chicken back in, and cook until it's heated through, stirring fairly often. This should only take a few minutes. Taste and season with salt & pepper as needed (there's a lot of cabbage so I used a fair amount of salt). Serve immediately. You can use smoked paprika or hot paprika if you prefer. Can you make this for me without chicken? And maybe like turn it into a soup instead. This dish is so simple that I had low expectations but it was great! I made a couple of small changes: I used ground veal instead of chicken chunks and I added ~1 cup of stock to the cabbage to give it some more flavor and help it cook down. I didn’t use paprika because I didn’t have any. I found the cooking times to be quite accurate. I ended up with a cabbage by a accident (long story) but I figured I should use it instead of letting it go to waste. I’ve never really liked cabbage enough to buy it but I was happy to find this recipe and was thrilled when I actually made it. It’s delicious! Looks like I’ll be buying cabbage now. Haha that’s great! I’m happy it worked out in the end. I’ve totally bought cabbage instead of iceberg lettuce before when I’m not paying attention lol. This was Great, but i did change/add a few things….i used 4 chicken thighs cut small (i rarely cook with the breast, i find the thigh to have so much more flavor and it doesn’t dry out), half a head of cabbage, about 6 small cloves garlic, smoked paprika, 6 slices pickled jalapeno diced, quite a generous amount of ground sea salt and 2 tablespoons butter at the end to add some richness. Fabulous!!! I agree about the chicken thigh! I’m glad that you enjoyed the recipe and your additions sound delish! Maybe the best thing I e ever put in my mouth! I made a few changes, but dang! That’s awesome!! Thanks for letting me know, Vic! This turned out so good. I came across this recipe just searching for cabbage recipes and had everything on hand so prepared and turned out quite good. Even my picky husband who I’ve been trying to get to eat healthy said “not bad”! That’s a positive review for him. And my husband does not typically like cabbage. I will make again!! Do you add the macros to your recipes I can’t find any. Hi Sue! Sorry – I don’t provide those. I’m not a trained nutritionist, so I don’t feel comfortable providing that info as it could end up pretty inaccurate. Very good and easy to make — will make again! Yay! That’s what I like to hear. Thanks for letting me know! Thanks a lot for the quick and flavoursome dish! It was approved by my husband and daughter (and me, of course!). I added a sliced carrot to give some more colour the plate as I served it with brown rice. Yummie! Can I ask you what part of Europe is this dish from? My husband thinks Slovakia or Austria. Anyway, it was delicious. If you have any other great recipes with cabbage like this one, please share!